The stylists at Beverly Hills St. John Knits are at your service to help you discover the St. John wardrobe that best suits you. Whether you’re getting outfitted for a red-carpet event or needing a casual weekend getaway wardrobe, the Beverly Hills boutique stylists are here to provide you with the completely personal and luxury shopping experience you’d expect from St. John. Be sure to ask about our many additional services including alterations, in-home delivery and one-on-one fit and style consultation. For more information please call us at 310-858-1116. From lifelong customers to celebrities alike, the Beverly Hills boutique has been a go-to for clients and all of their wardrobing needs. In fact, our reputation for incredible personal service and impeccable attention to detail is only matched by our hand crafted luxury designed collections including jackets, dresses, gowns, evening, couture and workwear. Located in the heart of Beverly Hills at 9536 Wilshire Boulevard, we're just a short walk away from Rodeo Drive and close to some of the most beautiful beaches in the country. At Beverly Hills St. John Knits, you can visit us any day of the week, and be welcomed by our wardrobe specialists dedicated to providing you with a personal luxury shopping experience. We practice craft and couture. With iconic American design and signature knits, we invite you to experience first-hand, the meticulous details, luxury craftsmanship, and one of a kind embellishments that have become synonymous with St. John Knits. 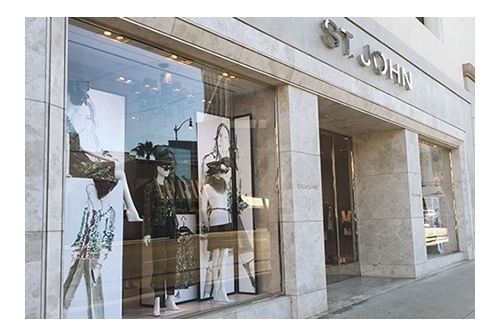 Visit us at the St. John Knits Beverly Hills boutique and we will personally guide you through the range of St. John collections to see the effortless, alluring and refined clothing that has appealed to women all over the world since 1962.